The rent at Pleasant Valley Apartments ranges from $544 for a one bedroom to a $810 one bedroom. Apartments in this building are about 14% less expensive than the Parma average. This apartment is in Parma. Nearby parks include Green Valley Park, Valleywood Park and Center Park. Pleasant Valley Apartments has a Walk Score of 58 out of 100. This location is Somewhat Walkable so some errands can be accomplished on foot. GREAT VALUE...WHY PAY MORE? Extra large one, two and three bedroom apartment homes in the heart of Parma. Conveniently located next to Pleasant Valley Shopping Center. Within minutes from Downtown Cleveland. Close to entertainment, restaurants, I-77, I-480 and so much more! Explore how far you can travel by car, bus, bike and foot from Pleasant Valley Apartments. Pleasant Valley Apartments has some transit which means a few nearby public transportation options. 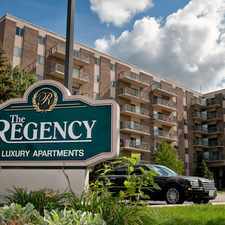 Pleasant Valley Apartments is in the city of Parma, OH. Parma has an average Walk Score of 39 and has 81,601 residents.